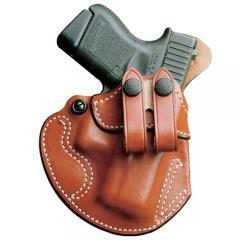 The Model 028 Cozy Partner Holster from DeSantis is a compact, durable and easily concealed holster that deserves a spot on every gun enthusiast's belt. Designed to rest as closely to the body as possible, the holster features exterior belt loops that allow it to be secured behind the belt. A flat back prevents any bruising caused by hard gun parts and helps to prevent any side-to-side movement. The easily concealed Cozy Partner is crafted from top-grade saddle leather that has been tanned and treated to perfection so it can be displayed with pride when discretion is not essential. Each holster is custom-molded and features a tension screw system for secure pistol retention that can be adjusted to user preference. A memory band integrated into the holster's mouth helps it keep its shape for effortless reholstering. Comfortable carry and the gun is very secure. Comfortable, but the snaps keep snapping off. I would like to return the holster ,And pick another one. How do i do this?. This inside the pants holster is fantastic. I have worn it daily for 2 weeks and really like the fit and comfort. I don't even know it's there. The reason I gave it 4 stars and not 5 is that I also have a DeSantis 2" belt but I have a very difficult time snapping the belt loops. Hopefully it will get easier as it breaks in. Great holster overall. Comfortable, good conceal, easy to put on. Comfortable and easy to remove when required. At first I thought the leather straps would be more clumsy than the basic clip style but they don't snag on seats, chairs etc. as bad as the clips do. I am wearing one of these holsters as I write this own (3) now for Glock 26, 19, & 30. They are very comfortable and easy for all day wear even for a big man. Highly recommend. Fits well. Carries well. Would like it to angle just another 20. Great quality. I already own two of this holster for other pistols. It's comfortable and keeps the pistol away from my side. Protects the pistol and me. Yes, just select "Smith & Wesson J Frame 36 (2" bbl)" as your fit. Unfortunately this holster will not fit the XDM .45. Please look at the DeSantis Insider holster.